Diddling hilarious! Take a look. awesome, just true in every way. 504Heater wrote: Diddling hilarious! Take a look. Good work. Just one quibble. 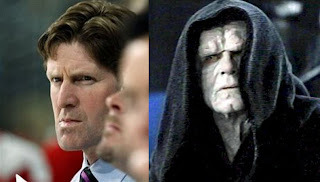 How can Chris Osgood be R2D2 when he plays for the empire? I'm trying to think of someone to nominate from Pittsburgh that's small, slow, and provides some comic relief. Help? There were evil droids were there not? any idea who we can fill in for the ewoks? SensFan71 wrote: any idea who we can fill in for the ewoks? How about Marty St. Louis, Mike Comrie, Ryan Shannon and Theo Fleury as Ewoks?